Norwegian authorities are holding a man described as a "Christian fundamentalist" in connection with yesterday's terrorist attack on a youth camp. At least 91 people were killed. The police said they did not know if the man, identified by the Norwegian media as Anders Behring Breivik, was part of a larger conspiracy. He is being questioned under the country’s terrorism laws, police said, and is cooperating with the investigation of the attacks, the deadliest on Norwegian soil since World War II. 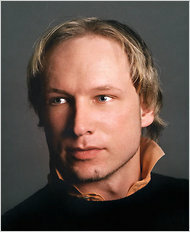 “We are not sure whether he was alone or had help,” a police official, Roger Andresen, said at a televised news conference, adding: “What we know is that he is right-wing and a Christian fundamentalist.” So far Mr. Breivik has not been linked to any anti-jihadist groups, he said.